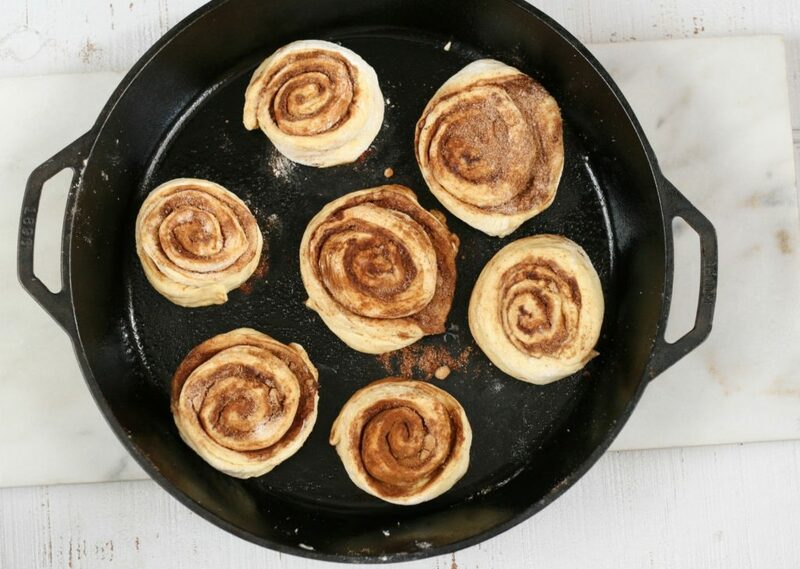 Cast Iron Cinnamon rolls are the perfect treat for your next breakfast or brunch. The most delicious, homemade cinnamon rolls you’ve ever had! Have you been looking for the best homemade cinnamon roll recipe? 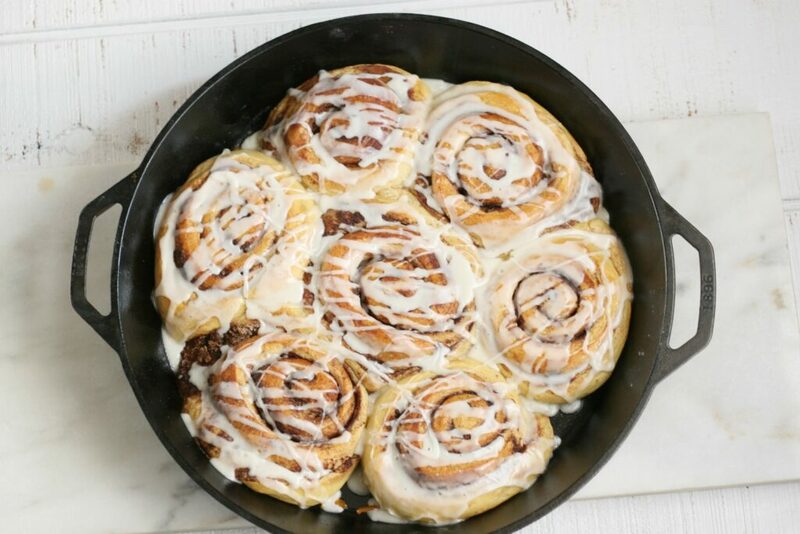 Look no further than these delicious Cast Iron Cinnamon Rolls! 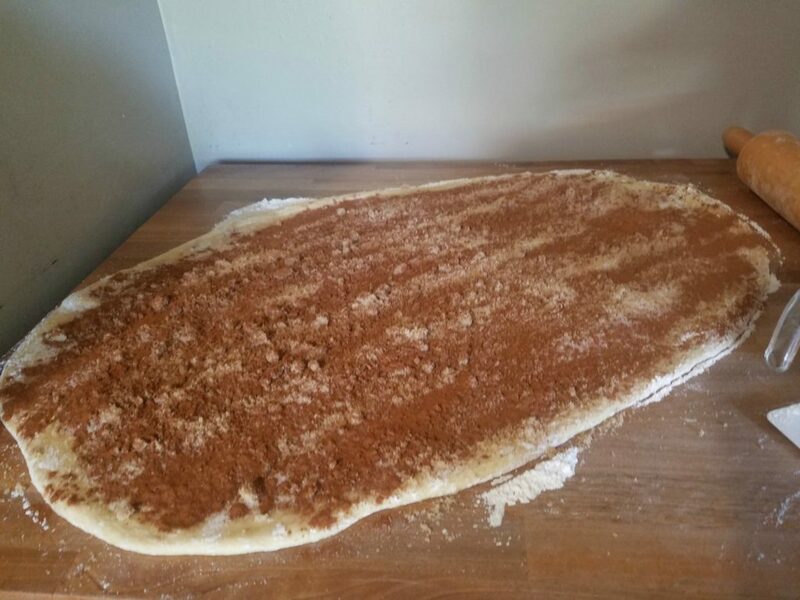 This sweet dough is easy to make and makes the perfect dough for cinnamon rolls. This is one of my most popular and most requested recipes! I mean, who doesn’t love a homemade cinnamon roll?! They do take some time, as the dough needs to properly rise. But, oh how they are SO worth the effort! Step 1: In a large mixing bowl of a stand mixer dissolve the yeast in the warm water. Add the warm milk, sugar, honey and eggs. Add the dough hook attachment, and stir in the flour and salt. Scrape the bottom and sides of the bowl occasionally with a rubber spatula. 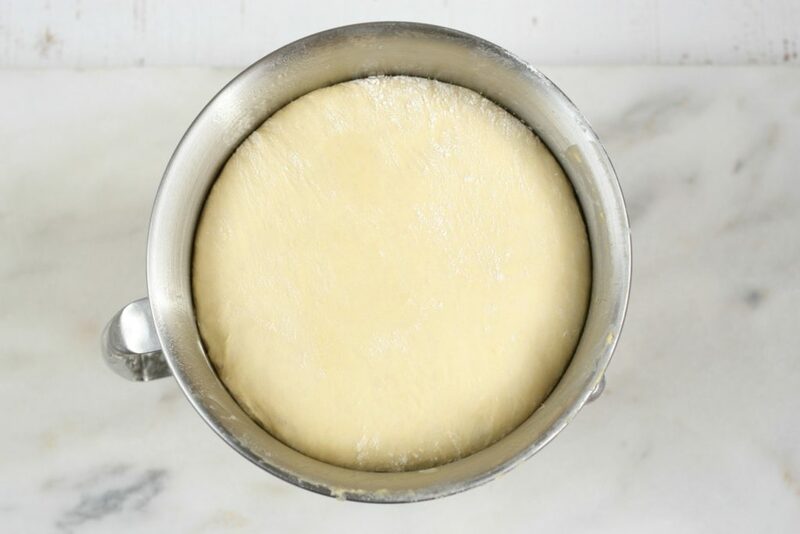 Cut the butter into small pieces and incorporate into the dough. Scrape the bowl a few times. Beat the dough until it becomes smooth, about 5-7 minutes. Step 2: Turn the dough out onto a floured work surface and knead for 5-6 minutes, making a smooth dough. This dough is going to be sticky when you turn it out. After kneading, shape into a round ball and place back into the greased mixing bowl. Cover loosely with plastic wrap and drape with a clean kitchen towel. Step 3: Place in a warm area and let rise until doubled in size, about 1 hour. Turn the dough out onto a lightly floured work surface and knead the dough for a few minutes. Turn back into the greased bowl (spray with cooking spray again if needed) and let rise again until doubled, about 1 hour. Step 4: Turn the dough out onto a lightly floured work surface and roll out with a rolling pin. Making it into a rectangle shape, about 1/2-3/4-inch thick. Spread the melted butter evenly with a pastry brush. Sprinkle the brown sugar and granulated sugar evenly over the melted butter. Sprinkle generously with ground cinnamon. Looking for one of the best wooden rolling pins made in the USA? Order this one, handmade in Maine by Fletchers’ Mill. Love red handles! Step 5: Place the cinnamon rolls evenly into greased cast iron pans or a half sheet pan lined with parchment paper. Cover the pan loosely with plastic wrap and a clean kitchen cloth and let rise until doubled, about 1 to 1 1/2 hours. Step 6: Preheat the oven to 350 degrees F. Once the cinnamon rolls have doubled in size, brush gently with an egg wash. Place the cast iron pan in the preheated oven and bake for 25-30 minutes. Let cool on a baking rack for 15 minutes before spooning the icing over top the cinnamon rolls. If you love these cinnamon rolls, use the same dough to create Apple Fritters. Those are always a huge hit in our household! This 17-inch two-handle cast iron pan is perfect for making homemade cinnamon rolls or even pizza. We absolutely love it for pizza! The 10-inch and 12-inch ones work so well for all of my pie recipes! Old Fashioned Blackberry Pie, Best Ever Homemade Apple Pie, Blueberry Pie. Do you love my recipes? Be sure and leave a star rating if you have a moment! Turn the dough out onto a floured work surface and knead for 5-6 minutes, making a smooth dough. This dough is going to be sticky when you turn it out. 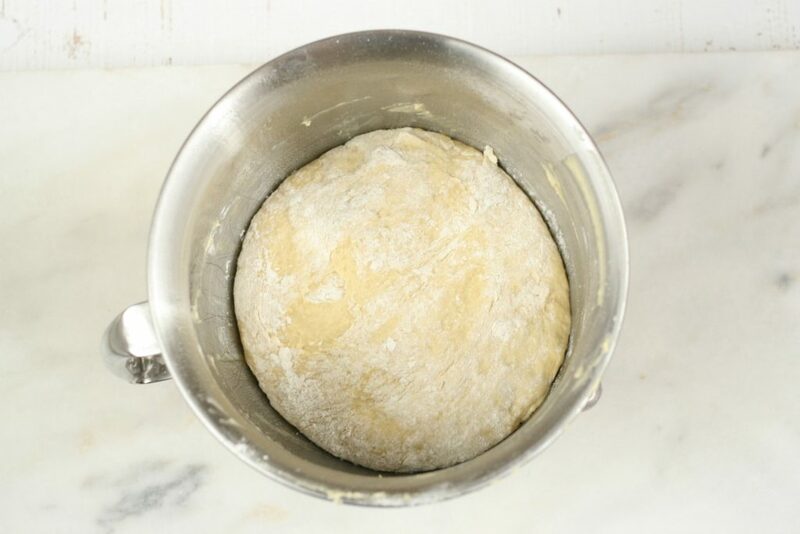 After kneading, shape into a round ball and place back into the greased mixing bowl. Cover loosely with plastic wrap and drape with a clean kitchen towel. Place in a warm area and let rise until doubled in size, about 1 hour. Turn the dough out onto a lightly floured work surface and knead the dough for a few minutes. Turn back into the greased bowl (spray with cooking spray again if needed) and let rise again until doubled, about 1 hour. 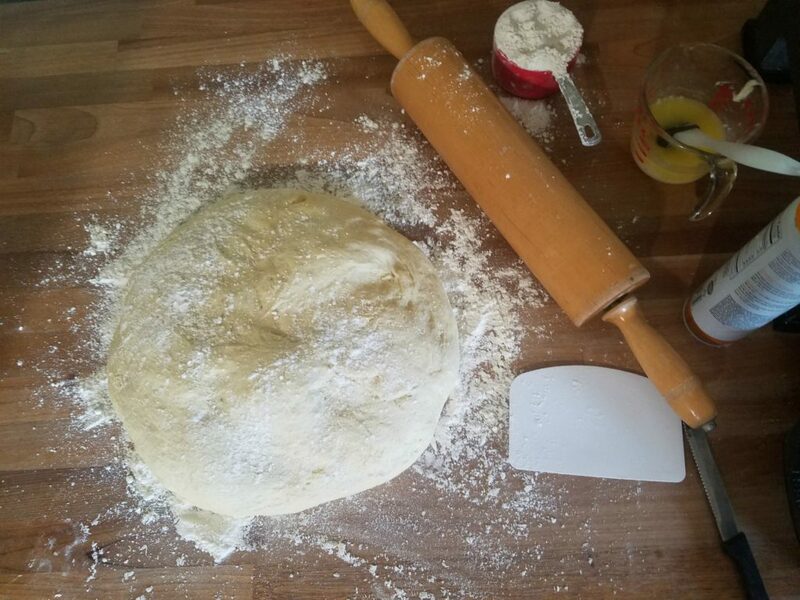 Turn the dough out onto a lightly floured work surface and roll out with a rolling pin. Making it into a rectangle shape, about 1/2-3/4-inch thick. Spread the melted butter evenly with a pastry brush. Sprinkle the brown sugar and granulated sugar evenly over the melted butter. Sprinkle generously with ground cinnamon. Roll up, starting at the long end fairly tight. Brush the edge of the dough with melted butter and press to seal. 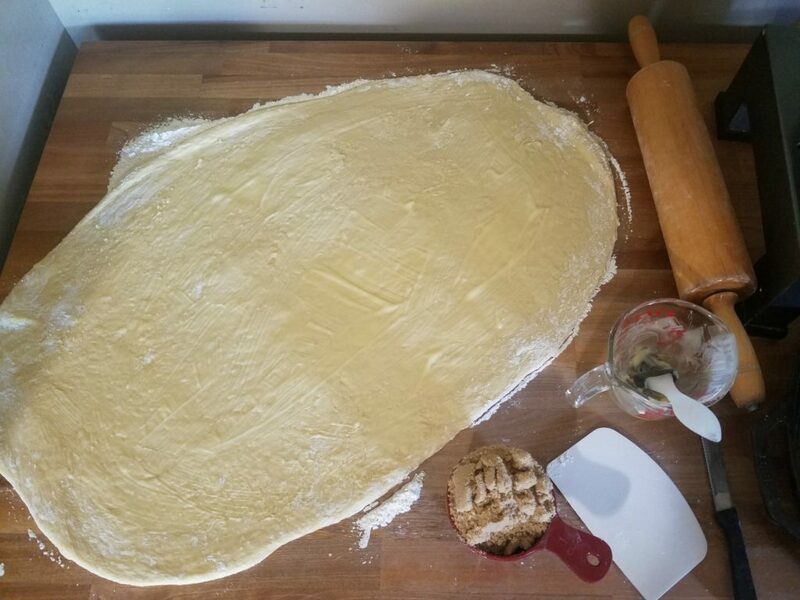 Cut the dough into 2 inch rolls. 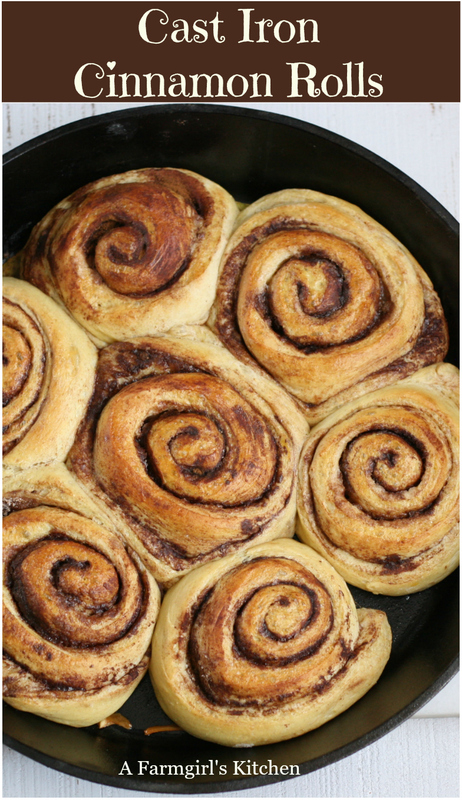 Place the cinnamon rolls evenly into greased cast iron pans or a half sheet pan lined with parchment paper. Cover the pan loosely with plastic wrap and a clean kitchen cloth and let rise until doubled, about 1 to 1 1/2 hours. While they are rising, whisk together your icing. Cover with plastic wrap and set aside. You want it to be fairly thick. Preheat the oven to 350 degrees F. Once the cinnamon rolls have doubled in size, brush gently with an egg wash. Place the cast iron pan in the preheated oven and bake for 25-30 minutes. Let cool on a baking rack for 15 minutes before spooning the icing over top the cinnamon rolls. They look so delicious! I love cinnamon rolls. It looks so easy to made but I’ve never tried to prepare them by myself I need to try your recipe! Oh I love cinnamon rolls! I have never made my own and had no idea you can make them in this way! they look delicious! These look absolutely delicious! I’ll be pinning this and will absolutely be making these on a snow day. Looks amazing! 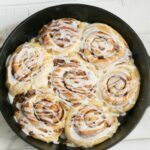 I’ve made cinnamon rolls in a cast iron pan before and they are fantastic! The little bit of crust on the outside of the roll is amazing. Omg that looks really yummm and the recipe looks pretty easy too… I would definitely make it for my hubby he just loves them ??? You made it look like making cinnamon rolls is as easy as counting 1,2,3. What I love about the recipe is how convenient it is in terms of finding the ingredients that you’ll use. Mouth watering rolls indeed. We love cinnamon rolls and this looks so good! Much better than what we usually buy here. I’ve never tried making it this way. I think it’s about time to buy a cast iron pan! Ha! Oh my god.. This is the kind of delicious thing I wish people WOULD NOT blog about. LOL. Cinnamon roles, along with those Boberry Biscuits from Bojangles, used to be downfall. yay! we love cinnamon rolls and we can’t wait to try out your recipe! We love cinnamon rolls when I crave we result to buying at Cinnabon or even at the local bakeshop. This is a perfect recipe for this weekend. My daughter and I are definitely going to do those this weekend. We love cinnamon rolls. And I love the way the cast iron skillet cooks up. Looks so fun and delicious. I can imagine the smell in the house when they were baking. I need to get me some cinnamon these have to be made. I wish I could have homemade cinnamon rolls for breakfast today! It would be a perfect treat! Five stars! I would never have thought of cooking scrolls in a cast iron pan. What a great idea! I don’t have a cast iron skillet- *gasp* I know! I’m sure that these will work with something else I haven’t made any cinnamon rolls that were homemade that have turned out correctly, but that won’t stop me from trying these. These looks so delicious. I love baking in my cast iron! It looks a delicious roll. You explained it step by step and I think, I should give it a try. OMG, I’ve never done cinnamon rolls from scratch. I will be making them this weekend. Who doesn’t love warm homemade cinnamon rolls with milk or coffee. I want to eat this so bad! it looks soooooo good! Cinnamon rolls is just something you can’t deny having. The process is pretty simple to follow. Perfect treat for indoor activities. I love to make cinnamon rolls for the family. We have a wonderful time together and waking up to the smell of those rolls baking makes our get-togethers even better (most of my kids are grown but when they’re all home to visit at once we make these). Your cinnamon rolls look amazing! I love the idea of baking them in a cast iron skillet. I love cinnamon rolls! Your recipe looks so delicious, and so easy to make. Will have to give them a try this weekend! I love cinnamon rolls! they are so good and perfect for breakfast or a snack! i have not had them in ages nor have i tried to make them! i will definitely try this recipe! 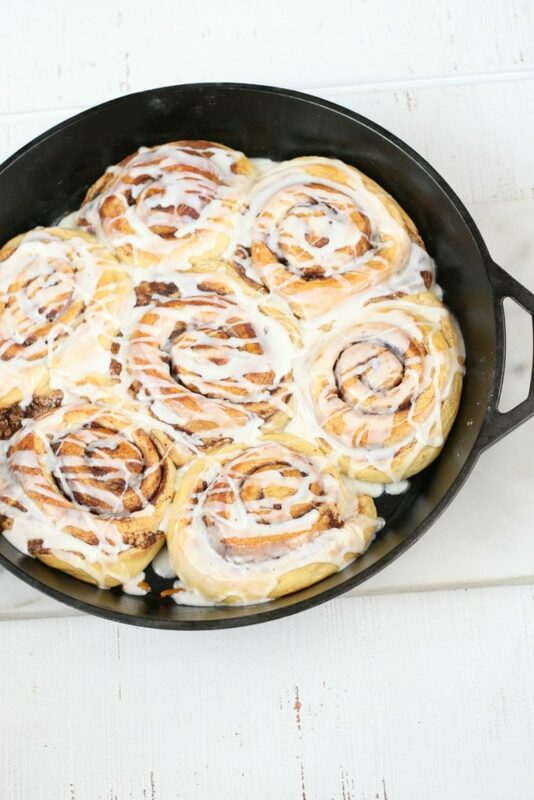 Cast iron cinnamon rolls looks delicious I like to treat myself some time like this for breakfast. Love your website and can’t wait to try some of your recipes! Do you take orders for your cookies and ship out of town? I love the valentine’s cookies. Beautiful! Thanks! Yes, we can certainly ship cookies! Just send me an email. [email protected] and let us know what you’re looking for!